Today is the official day, 100 years ago today, Shirley Jackson was born! She is a beautiful woman and has been for 100 years. No newfangled fancy face cream that claims instant beauty....after all they didn't have that 100 years ago!!! Natural Beauty that shines from the inside out through her sparkling eyes. Family photos were fun to look at during the party on Saturday at the Towanda Gun Club....gotta love that...partying at a Gun Club :) Nanny hunted until she was 85 and I bet if you handed her a gun today, she would still be able to shoot a Buck. Zachary made a glass bead bracelet and he was so excited to be able to give it to her. Handmade is a family tradition. Among other wonderful things, Nanny is a quilter. In the "old" days if people could not come to your party, they would send a telegram....not today....they can attend the party through Skype. 100 years is a long time to witness all the changes in our society....amazing when you think about it. IHAN clan posing behind Nanny while she is visiting by Skype with two of her great grand sons. IHAN is inviting you to celebrate with Shirley Jackson too. 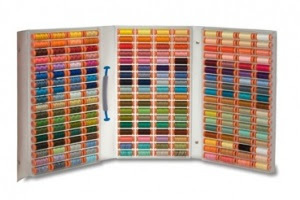 From now until March 4th, 2010, you will get 25.00 off your order of Aurifil Threads by typing in 100 Birthdays in the coupon code box on the IHAN website check out. Hi from PA....here for Nanny's (Rick's Grandmother) 100th Birthday Party....and she is a quilter too!!! 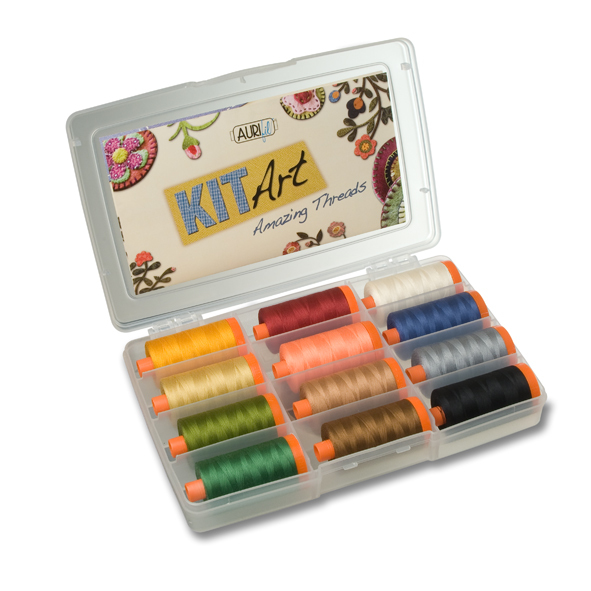 I hope everyone had fun....if you have not had the pleasure of trying some Aurifil Thread and would like to..Try it.....Check out the original post for some excellent places to purchase it. Hello Aurifil Blog Hoppers and welcome to the IHAN (I Have A Notion) blog. Have you had fun this past week? 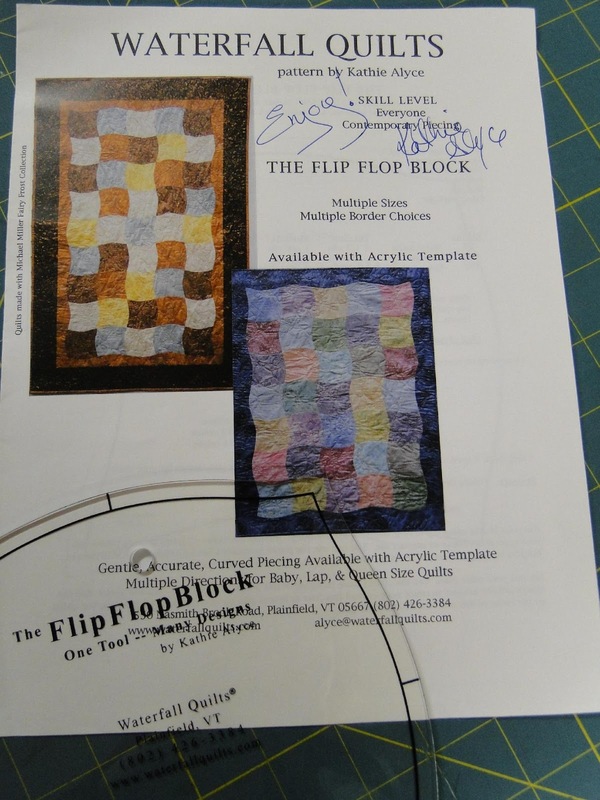 I know I have enjoyed visiting all of the blogs and collecting some great block patterns. Truthfully the reason I think I got the letter T is because I'm a Thief. It's True and I have photos to prove it. Taking The Thread.....can you blame me? I only wish I had worn pants with an elastic waist. I could have gotten that entire container in my waistline and covered it with my shirt. Instead, I had to go for the smaller box....shoved it down the back side...better know as the Tush. I could not stop at a few spools....I Took the fork lift and Trotted off with the entire crate. You know what? I have no shame and no regrets. Are you wondering what could possible cause an otherwise honest woman to become a Thief? 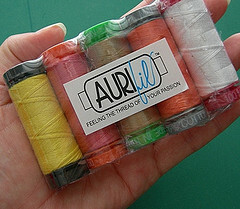 Try Aurifil for yourself and then tell me you don't want it ALL....yes a spool or several in every color and weight. Just try to tell me if given access you would not attempt the same heist? No lint, no breakage, beautiful colors, 12 wt, 28 wt, 40 wt, and 50 wt Thread. Yep, I'm Thinking you would be Tempted to be a Thief Too! By now you have read all the other Testimonials from the other Blogs in this Hop so you know of what I speak. The quilt blocks the other Bloggers designed are wonderful. I'm a notions girl so designing blocks is not my Temptation.....instead I made this Joseph's Coat block pattern. Tickled that I made the block Then I was Tormented when I realized I had been calling it "Jacob's Coat." I invite / Tempt you to Try The Thread That Tempts The Thief To Take it, AURIFIL. Everyone will have a chance to win the Grand Prize, Pat Sloan's 50wt Machine Quilting and Applique Thread. I wish you all the best of luck in winning some Aurifil Thread....if you don't win and you would like to Touch The Thread That Tempts The Thief To Take it, you can check your local quilt shops as well as Pat Sloan's Quilt Shop, Pink Chalk Fabrics, Stitchin' Heaven and of course right here at I Have A Notion. This is the I-Top booth from Houston Quilt Market. They actually had all their supplies set up and they let who ever wanted to make something....make it. I thought that was a good idea because it is one thing for the demonstrator to make something with their tool....it is quite another when I make something with a tool. Embellishments are my weakness....yes I have several....but who's counting? Can you imagine how eye-catching a pair of flip flops would be with a fashionable flower like the ones below (properly sized of course...unless you are going for the Bozo look..lol)? I made a button quite easily and I'm sure it is around here somewhere....think I can find it for today's post? Nope. Oh well, I'm honest and you know that....it was really cute too. The I-Top would have come in very handy several years ago when I made children's items and supplied them to Boutiques. Covering buttons is a great way to embellish a hair clip or headband. We used to have to make them the old fashioned way....not any longer. Some pretty smart whipper snapper came up with this tool and all the little "gizmo's" to go with it. Here they are, all the "gizmo's"....headbands, brads, buttons, magnets, badge pins, rings, snaps and even bobby pins. Someone was cooking on all four burners and I wish it had been me! Check out how sweet these children's items are with the help of a I-Top embellishment....now if I had had this tool....I could have retired on my profits. Perhaps I'll invent something else one day....hmmmm.....we'll see...chuckles. You may notice on the IHAN website that if you want to order the "gizmo's" they come in 6 packages. Ya'all know I can't stock 7 million dollars in "gizmo's" so if by chance you can't use them all (are you nuts?....oops...that bubble above my head started typing...yikes) you can e-mail me and I'll see if there isn't someone else who wants to split them with you or you could ask a friend. I certainly hope you find some fascination in your day today. TrueCut - TrueSharp - Could it be....True? This is what I purchased in the Spring, TrueCut Cutting Mat 24"X36", TrueCut Non-Skid Pad 24"X36", TrueCut Ruler, and TrueCut Rotary Cutter 45mm, and the TrueCut Sharpener. You have probably seen the mat in most of the photos I take because it is on my cutting table. Then in the Fall in Houston I stopped by their booth and what did my eyes behold? The TrueSharp, power rotary blade sharpener. Another blade sharpener, but this time it is electric. I liked the manual one but electric, oh they got my attention. Naturally I asked for a demo and asked all the difficult questions I could think of, thankfully Nathan didn't ask me to leave...LOL. I do my very best to be respectful while at the same time asking every skeptical question I can think of to learn about the various attributes of a product. AND My Comfort Cutter, a right and left handed rotary cutter that eliminates stress on your wrist. It is customizable too.....which may seem silly until you loose yours at a retreat or class...have had it happen. It also has been made to work with the TrueCut Ruler Track which keeps the cutter from slipping off the ruler and cutting something other than your fabric. My Comfort Cutter comes in 28mm, 45mm and 60mm. Of course I had to give it a go....and honestly...it was easier on my wrist. I was surprised that I really liked it as much as I did. I was also pleased to see new rulers being made. I imagine those will be shown at Spring Quilt Market....so this is your sneak peak. Now, the IHAN TRUE TEST....did it work? Was I convinced to spend my hard earned money to prolong the life of my rotary blades? oh yeah...and instructions...but why? Don't they know we don't read those? Yes, I did get both....after all how can I demo them if I don't have them right? RIGHT!!! I was in good company too.....check out who else was inquiring at the next table....none other than "Lady Eleanor" herself. I was not sure weather to curtsy or bow.....but she is so warm and welcoming I didn't think I needed to do either. Gotta love our Quilting Royalty....they are not stiff and excessively proper like the English Monarchy....ours are warm, kind, friendly and always willing to teach you what they know. I'll leave you with their video so you can see how the cutter and track work. By the way, have you noticed the Aurifil Blog Hop schedule on the right sidebar? If not, better get to hoppin in you want to win Aurifil Thread. Did everyone see the Aurifil Blog Hop Schedule on my side bar to the right.....yeah that one. Stop at each of the blogs during the week where you will find block patterns AND a chance to win a box of Pat Sloan's 50wt Aurifil Thread Kid. Well you are not alone. I want one too. I feel like the lady at the other table in the movie "When Harry Met Sally" remember her when she said...."I'll have what she's having"....yes...that one!! This time there can be no "faking" you have to guess the number of spools of Aurifil Thread in the Aurifil Trunk....click here , the Aurifil Facebook Page, to find out all the details and to guess. Are you like me and keep extra toilet paper, napkins, paper towels, toothpaste and shampoo in the cabinet so you won't be frustrated when you run out? I even keep extra boxes of Kleenex just in case. I was raised by a single mother with a high school education. When she divorced my father, she had to go to work and her starting salary was 6,000 a year, with 4 kids to feed (2-10 yrs old) So we frequently ran out of things when I was growing up and I can't recall ever having paper towels or Kleenex (we used toilet paper). Now that I'm an adult, I don't want to run out so I keep extra around. Cara from Cara Quilts Blog ran across some folks at a shelter who put a sign out that said, need paper towels. I'm only guessing....but I would suspect that the sign was probably put there by a frustrated staff person who had brought so much from home already they felt it was someone else's turn to help out. If it were me. I would do that.....just stick a sign out in the yard and see if anyone was willing to help. Cara did help....she took them some paper towels. I'm guessing most of you would have done the same thing....and I'm sure have done this....many times over. 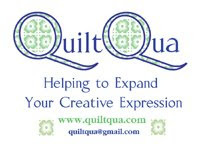 Hop over to Cara Quilts Blog and read about here experience and challenge. Not that any one of us would do this to win a prize....but let some of us shower a few prizes upon those who are willing to help out and join Cara in her compassion towards those who are in a scary transition in their lives. You know when you have "arrived" in mommy life when you are invited to give a talk at your child's school. A rare and savored moment when my son was so proud and pleased that it was "his" mommy talking to the entire 2nd grade class. Remember those days? The kids are reading a book about a quilt so I was invited to come and talk about quilts today. I literally had 10 minutes to set up and 10 minutes to take down ....that is why the quilts are piled on the table. I brought my current sewing machine and an older model (made before I was born...good to know I was not the oldest in the room :) I was thinking that children who come from families who don't sew might not have ever had the opportunity to see a sewing machine. There were several who raised their hands when I asked if this was the first time they had seen a sewing machine. I started by showing them a quilt made by Mr. McSteamy's Grandmother (who will be 100 in 2 weeks). This is a mug rug (one of you will recognize it, it was a gift : ) that I sent around for kids to touch. The loved seeing such a "small quilt." I told them that people from all over the world swap these and fabric postcards too. Of course I had to get my pitch in for recycling. I showed them a feed sack dress and shared how it was recycled from feed sacks.....just in case they thought recycling is a new invention. Nanny, Rick's Grandma, made this one and gave it to Rick and I for our wedding. She was 89 when she made this and it is hand appliqued. Could we all be so lucky? I sure hope so.....especially since I have projects to keep me busy until I'm 124 years old. Aaron was beaming when I showed this "Crayon" quilt. I made it for him when he was a baby. My only sampler quilt, "Many Hands." I thought it would be a good one to show all the variety of blocks. This was not even washed....it was taken straight off the sofa and put into a box and to the school....nice ay? Of course I had to show them some Hawaiian applique. I explained the difference between hand stitching, needle turn applique and machine applique. These were needle turn applique and hand quilted....by none other than MJ...Thanks again, and again, and again! My signature quilt, "Crossroads." Given to me by MJ...she had all my PA friends sign it when I moved away. I cherish this piece. The kids liked that you could "write" on your quilts. Hope they don't go home and start autographing without permission....yikes. Thankfully, my friend Diane, loaned me some quilts to take with me as well. Believe it or not I don't really have any "fun" kid quilts. I need to get that on my list. Diane shared these with me and the kids absolutely loved them. This Halloween one was done with machine embroidery so that was cool to be able to show them that as well. This quilt was just way toooooo coool! The kids were pointing and talking....Thank You Diane!!! These two are Diane's stained glass quilts. One of the kids said, "hey, they have that at my church." I need to Google "possession" again....because if I remember correctly.....possession is 9/10ths of the law isn't it? Another one of Diane's quilts, a photo quilt. Neat for the children to see you can use photos on quilts. Waldo's grand daughter made this one. Maddy made this using fabric swatches and she tied the centers. The kids were interested in a quilt made by another kid.....hmmmmm....I gotta get my co-workers busy quilting too. Of course I loved showing this table runner made in Kenya at Amani Ya Juu. What fun being able to share a little of Africa with them today. Then on to India.....still not quilted...."Passing the Sacred Orb." Hey, a wild hair may just grab me and it will be done in no time.....oh yeah baby. This was the insane part. When I was asked to come and talk about quilting I opened my big mouth and said I thought it would be cool if the kids could make a paper quilt. That was when it was just Aaron's class....then it was all of the 2nd graders....106 of them. So, it went from a paper quilt...to one block! We cut a zillion little pieces of scrapbook paper and put them into envelopes....a little block kit for each child. I showed them how they could use their pencil or marker to do the stitching. Note to self.....cutting a zillion little pieces of paper and counting them into kits takes a lot of time....next time....let them color in a quilt made on my EQ 7 Software!!! Speaking of the Electric Quilt Company, I phoned them yesterday to see if they had ever presented to children before and did they have any recommendations. (Ya gotta go to the experts!!). They were so kind to e-mail me a little demo so I could show the kids that quilting has gone high tech and you can design quilts on the computer (fascinating to this middle aged mind). McSteamy came home for lunch and helped me pack up the van and off I went to the school. Guess what was not in the van? Yep....my laptop. He figured I did not need it (he had didn't know what I had planned). But....I'm ready to go next time :) Thank You Penny and everyone at EQ who helped me out! They rock....but IHAN blog readers already knew that, right? Right! Well....sheepishly I share this pix......my new Tutto Machine on Wheels Bag....was delivered the day before yesterday but I did not open it because I've been sick. So this morning, I figure if I'm taking Martha to school....she needs her Mercedes to ride in....so I put baby Martha into her new Mercedes and off we went. Dang....I love this Tutto Machine on Wheels. Wanna know why I did not pick that pretty Red, Lime or Purple? Yes you do....don't act like you don't care....ok, so you don't care....just let me tell ya anyway....come on please...... because everything I have gets dirty...this won't show the dirt so quickly. What's New At I Have A Notion (IHAN) ?